Today has been a very long day. Ben left to go to a conference in Poland until Wednesday, so he was out the door before 6 a.m. to catch his flight. Unfortunately for me, I’m one of those people that once I’m awake, I’m awake. So I’ve pretty much been awake since about 5 a.m. When I decided to actually roll out of bed 2 hours later, I was greeted by the most enormous spider I have ever seen!!! I am absolutely terrified of spiders, so I found myself frozen in the doorway, facing off against this creature who was preventing me from entering my bathroom. Normally Ben comes to my rescue (as he did last night when he went after another giant spider that had crawled under our bed), but he’d left hours ago and I was left to fend for myself. So what else could I do but start throwing shoes at it? It was the most logical solution. Four tosses later, and the sucker was squished under one of Ben’s boat shoes, which is where he will stay until someone braver (i.e. Mr Moxey) comes home to dispose of the evidence. I have no idea where all these spiders are coming from all of a sudden, but hopefully that will be the last one until at least Wednesday. Anyways, back to business. This week on the Bake Off, the challengers made flourless cakes, or tortes. Originally I had planned to make a chocolate one, but I’m afraid that chocolate is the absolute last ingredient I want to have in the house at the moment. I spent all of Thursday touring around London visiting chocolate shops, gelaterias, and patisseries for a project at work and ended up getting really sick Thursday night and felt like crap most of Friday from eating so much rich, dark chocolate. So yeah, taking a break from that. So to find a recipe for Plan B, I went to the Bake Off authority herself, miss Merry Berry. This recipe is from her Baking Bible, and uses whipped cream and lemon curd to make a delectable filling. 2. In a large bowl, whisk the egg yolks and sugar until they are pale and have a light texture. Add the lemon juice and continue to whisk until the mixture thickens. Fold in the lemon zest, followed by the semolina and ground almonds. 3. In a separate bowl (preferably with an electric mixer), whisk the egg whites until they form soft peaks, then fold into the egg yolk mixture until it’s evenly blended. Gently pour into your prepared baking tin. 4. Bake for 30-35 minutes or until it turns a pale golden brown (I did mine for 13 minutes in the two tins). Leave to cool in the tin for 10 minutes before removing and placing on a cooling rack to peel off the baking paper and cool completely. When cool, cut the cake in half horizontally. 5. Whisk the cream until it thickens and holds its shape, then fold in the lemon curd until it’s evenly blended. 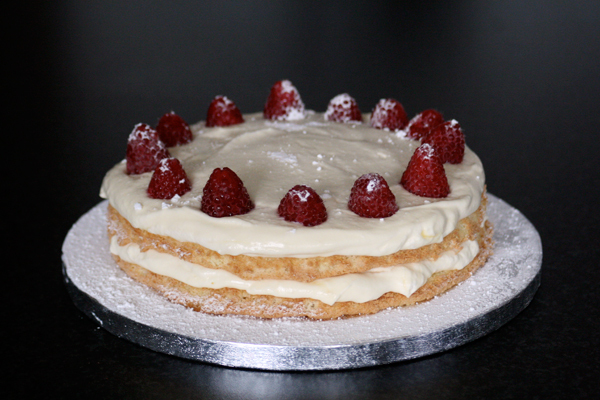 Spread half of this onto the bottom layer of your cake, then place a few raspberries around the cake. Add the second layer, then top with the rest of the whipped cream mixture. 6. 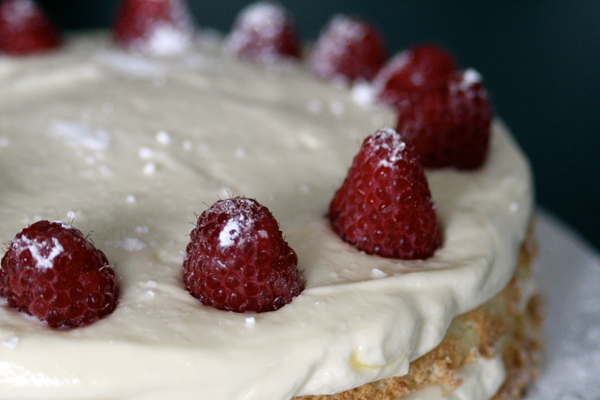 Add a ring of fresh raspberries around the top, then dust with icing sugar to finish it off.